This was supposed to be published last Monday but given the it was a comedic piece, it hardly seems appropriate to feature right after Farewell Auntie Lim which essentially is my way of an eulogy. Anyway, the week of silence is over and it's time to move on. So without further ado, what better way than to open with another Sian XMM Episode? I can see it in the headlines of all major papers now…. 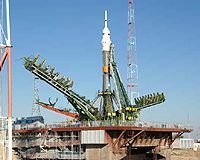 “Baikonur, Kazakhstan (JW) - It has been confirmed by launch HQ that Sheikh Muszaphar Shukor has disappeared. Despite the confined space of the spacecraft, team mates were not able to locate Shukor. “It is as if he disappeared into thin air!” quipped fellow astronaut Peggy Whitson. The last where anyone had seen Shukor was at the Quarantine Pod where he was overheard saying something about stepping outside for a smoke. It all started innocently when naeboo was writing about the first Malaysia space flight participant astronaut when I was goofing around by cheekily adding a news spoof in her comments section. Anyway, I thought it was pretty funny (yeah.... I am laughing at my own joke. I am going loony...) that I decided to post it as a note on my facebook for all to have a laugh. So up it goes without much thought when two hours later, my MSN chimed and Stockbroker Girl (identity changed for obvious protective reasons) got me all floored with her following dialogue. To my defence against allegations by Aloe and Hitomi that I deliberately set it up to trap all the innocent XMMs, I plead not guilty. It was never my original intention but hey, what was I to do when a fish were to jump aboard your boat when you weren't even fishing in the first place? Read on as I collect my 13th Episode of the Sian XMM Series. 3:43:23 PM JayWalk: i hope you got the joke when you ask me that. 3:45:01 PM JayWalk: how you smoke in space? how many ppl fell into the trap>?